... until Thanksgiving. Over the holiday, my dad, my boyfriend and I all went into the Florida swamplands with the intention of killing a pig. I wanted to see how being directly involved in an animal's slaughter would affect my feelings about eating it. 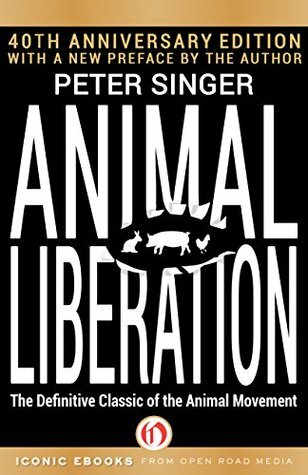 A day or two after the hunt, I started reading Animal Liberation by Peter Singer. First published in 1975, this classic is a rousing call to action against the many atrocities of factory farming. Singer's argument revolves around the concept of "speciesism," or humankind's inherent belief that they are superior to all other animals, and how it leads us to devalue animal suffering in favor of our own ease and enjoyment. "The principle of the equality of human beings is not a description of an alleged actual equality among humans: it is a prescription of how we should treat human beings." "If possessing a higher degree of intelligence does not entitle one human to use another for his or her own ends, how can it entitle humans to exploit nonhumans for the same purpose?" "The question is not, Can they reason? nor Can they talk? but, Can they suffer?" I do not regret killing the pig nor eating it, but I don't know that I could ever do it again. The ninety or so seconds it took to die were some of the most deeply uncomfortable moments I've ever experienced. This was an animal that had free reign of its surroundings until it died, too, unlike many of the animals that end up packaged for sale at the grocery store. I'm slowly coming to terms with the fact that I may never have my beloved sesame chicken again. I'm still figuring out what to do about other animal products, like eggs, milk, and cheese. I get the sense that I'll be "figuring this out" for some time yet. I'm grateful to have had Singer's seminal work to refer to at a crucial moment on my journey. Ultimately, Animal Liberation is heavy, polarizing, and the kind of book you absolutely have to read for yourself. I think that all kinds of eaters and activists will find plenty to think about, and I'd love to have more people with whom to discuss it! Have you read Animal Liberation? Let's chat!